PDF FILE 1000 pages several hundred pages pictures demonstrating combat tactical energy assault conditioning / China’s Military Academy Gen. LI Yuan Chih and Cmdr. creating the Invincible Assassin with Supernatural Immortality powers. QI Gong Dragon pressurized force maneuvers generates energetic explosive force that activates acupuncture energy fields with quickest response and immediate assault. The Assassin senses danger that activates the Yintang acupuncture energy field point between the eyebrows develops a strong intuition sensing danger. Just above the Yintang is the Sky Eye protects the assassin with spiritual energy. Going up past the Sky Eye above the hairline is Shenting acupuncture energy field that transmits signaling received from the atmosphere. The Taiyang acupuncture energy field points located 1 inch from the eyes on the side that increases vision executing instance response to the retina and the optic nerve that originate as outgrowths of the developing brain. The retina is considered part of the central nervous system and is brain tissue. The retina at a heightened level in visual imagery training sees the smallest intricate movements as the imagination develops energy pathways. The retina transmits electrically signaling through sensory neurons electrically excitable cells to Shen Psyche energy that sends electrically impulses to the brain. Signals are transmitted instantly astronomical times in each maneuver and traditional system to develop amazing quick reaction time. process is vital to prevent arthritis in the joints that can cripple the structure of the body the entire life. Assassination Maneuvers evolved by Emperors, Military Generals, Taoist and Shaolin Monks over 7000 years. The Imperial Tang Dynasty 618-907 with a population over 80 million supplied professional and conscripted armies that conquered for power. Military Generals witnessing warriors on the battlefield created strategic, ingenious, and scientific combat tactical assault conditioning maneuvers in a chronological order to evolve Imperial warriors with supernatural powers. This extraordinary system excelled over thousands of years and trains soldiers at China’s Military Academy. Gen. LI Yuan Chih and Cmdr. Hsu, Fun Yuen executed Cobra, a secretive Special Forces assassination system to create the Imperial Warrior invincible assassins with supernatural immortality powers. 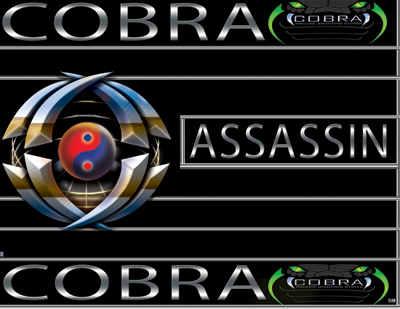 Cobra assassins are at the supreme level for United States Special Forces executing tactical combat assault energy conditioning maneuvers. Military level is created for Soldiers and Law Enforcement agencies. Assassin energy transformations can give professional athletes instant response, quick reflexes, and incredible endurance. transformation secretive energies through meridian thrusting channels developing supernatural powers. secret QI Gong. Military Taijiquan created by General QI Wei Dynasty in 477 AD, Xingyiquan created by General Yue Fei Song Dynasty 960 to 1279 AD, Tongbeiquan Wei Dynasty, Shaolin Northern Wei Dynasty in 477 AD by Emperor Xiaowen military leader. Baguazhang evolved by Taoist and Buddhist Monks over 400 years ago. China’s original traditional military systems date back 7,000 years with the discovery of QI Gong, the five elements, acupuncture, internal medicine, and the secretive three treasure energies by Taoist Monks that is the foundation for all China’s military systems. Traditional secretive military systems are enormous requiring 20 dedicated years to master as maneuvers break the system down into smaller routines that are executed in a magnificent fashion with incredible results while mastering the system. Primitive war weapons as spears, kwandaos, pudaos, staffs, swords, broad swords, and daggers were vital to master as survival on the battlefields demanded incredible combat skills. Generals created an extraordinary combat tactical energy conditioning system to maneuver these heavy weapons in long battles exploding the transformation of intrinsic energies to keep soldiers at a heightened level consistently rejuvenating energies and eliminating fatigue. to maintain efficient energy transformations that keep you young and healthy. Shen conscious and unconscious mind is structured to eliminate all psychoactive substance abuse and psychological depended that have destroyed our world. When Shen is strong the body is powerful allowing life to be lived at its fullest . Army Cmdr. Tohei, Zen Priest Toyoda, and Shaolin Warrior Monk Lee certified Joseph Dodaro to Prof. of QI Gong, Taijiquan, and Shaolin. Master of China’s military systems, and Sensei of Aiki-Jujutsu after 55 total years of dedicated private training. Gen. LI Yuan Chih and Cmdr. Hsu, Fun Yuen of China’s Military Academy specialized China’s combat conditioning system Cobra Level 1 the Imperial Warrior Invincible Assassins. Level 2 Special Forces, Officers and level 3 Military Soldiers. Cmdr. Hsu designed United States Cobra Level 1 for the Department of Defense and level 2 for the Department of Justice. Cobra Level 3 for high level professional services as bodyguards and security agencies. Cobra Extreme an explosive military system designed for actors, actresses, and stunt fighters. Cobra is a code name that encompasses eight authentic traditional Chinese Military systems that evolved over 7,000 years created by Emperors, Military Generals, Taoist and Shaolin Monks proven effective on battlefields. China’s secret weapon is the invincible assassin with supernatural powers and immortality forces. Cmdr. Hsu, Fun Yuen of China’s Special Forces Certified Joseph Dodaro over 20 years of private training from 1977 through 1997 to Master of China’s Traditional Military Systems June 30,1991. Cmdr. Hsu was responsible for training all of China’s government agencies and highlevel officials. China’s Military Academy Gen. LI Yuan Chih and Cmdr. Hsu evolved 21 Special Forces Soldiers to unique Imperial Warrior Invincible Assassins with supernatural immortality powers. Emperors and Military Generals over 7,000 years witnessing Warriors on the battlefields created 8 traditional secretive military combat energy conditioning systems. Chen QI Gong Meditative Pressurized Breathing Devastating Exploding Force was the secret weapon. 1) Wu Xing Five Elements, Five Phases 2) Special Forces Secretive Dragon QI Gong Energy Transformations 3) military levels of Yang and Chen Dragon Taijiquan 4) Tongbeiquan White Ape 5) Xingyiquan Twelve Animals and Five Elements 6) Baguazhang Eight Trigram Palm 7) Shaolin Quan-Fa Tiger Cobra 8) Assassination 21 Phases QI Gong Energy Transformations Conditioning Maneuvers. Transformed with Five Traditional Chinese Elements Wu Xing and Three Military Phases of Dragon-Earth / Snake-Water / Tiger-Fire / Crane-Metal / Panther-Wood / Gorilla-Force / Eagle-Spirit and Tiger Cobra Quan-Fa. Cmdr. Hsu and Gen. LI were sanctioned by the government to create invincible assassins engaged in professional guerrilla warfare ending the war against Japan. Dr. Hong Chao Zhang of Wushu advanced Master Joseph Dodaro over 20 years of private training from 1996 to 2016 to Prof. of Military QI Gong March 6, 2015, Prof. of Military Taijiquan Oct. 8, 2014, and Prof. of Military Shaolin on Feb. 8, 2015. Dr. Zhang a government educator is one of the five founders of QI Gong Research Association at Wuhan and Shanghai Institute of Physical Education where he holds Bachelors and Graduate Degrees in Gong Fu. Wushu is a classification of China’s combat energy conditioning systems over 7,000 years continuously being researched by Generals, Shaolin Monks and government research centers. Secret family clans transferred their knowledge to Dr. Zhang to train government Professors at universities to preserve this treasure. Cmdr. Koichi Tohei of Japan’s Imperial Army, Founder of Shin Shin Toitsu Aikido, and KI NO Kenkyukai Certified Joseph Dodaro to Sandan (third degree black belt) in KI Aikido / Aiki-Jujutsu July 24, 1987, Shoden fourth advanced level of KI Development August 25, 1986, and Associate Lecturer September 16, 1995. Master level of Kiatsu. Sensei Joseph Dodaro is authentically internationally register at Aikikiai Hombu Dojo Japan. Zen Priest Shihan Fumio Toyoda Uchideshi under Doshu Kisshomaru Ueshiba Aikikiai Hombu Dojo Japan certified Joseph Dodaro to Yodan (fourth degree black belt) Sensei in Aikido / Aiki-Jujutsu May 18, 1998. Over 27 years 1974 to 2001 Japanese Military Police Traditional Aiki-Jujutsu and Aikido, Qinna joint locks, quick takedowns constrictions, and knife combat. Sensei Joseph Dodaro is internationally register at Aikikiai Hombu Dojo Japan. Shaolin Warrior Monk James Lee certified Joseph Dodaro to Master of Shaolin Quan-Fa Jan. 1, 1995 a secret family clan Art after training with his Disciple 1971 to 2010. First non-Chinese to receive a Master Level in a Chinese Family Clan and Japanese Family Clan.